Tree-hauling preparations started last week with a search for LED-battery-powered-holiday-bike lights. We love using these festive lights in the winter, not just to spread holiday cheer, but also for safety, they provide excellent side visibility! They come in all shapes and sizes: from stars to pine cones to super mini-bulbs. We string them through our front baskets and weave them around our rear Xtracyle Snapdecks. Drivers really appreciate a festive well-lit bike, and often stop us to compliment our high-vis-decorated bikes and cool lights. We try not to be wasteful in general, Tim is a DIY-fixit-guy in our house, and can fix most anything if he puts his mind and his time into it. Even if they can be fixed, these cheap battery-powered lights definitely fall into the throw-away category. If you’re a hard-core-no-waste person, I’d recommend skipping them, they just don’t last very long; one season, maybe two if you baby them. 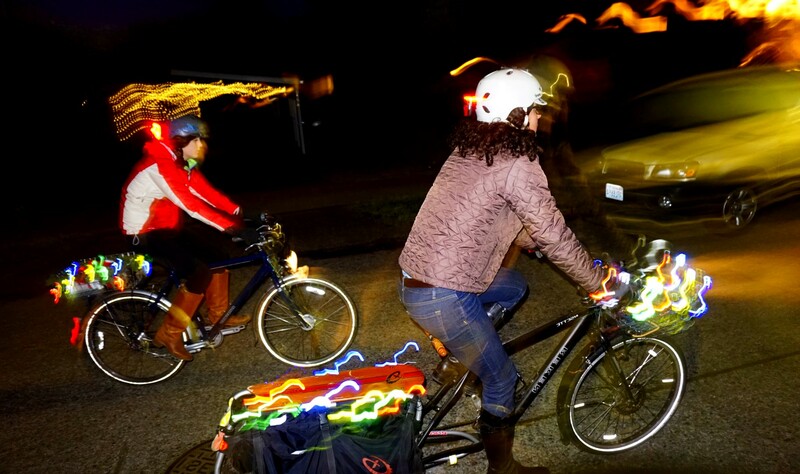 Because these holiday lights adorn our utility bikes, wrapped around bike baskets and Xtracycle snapdecks, they experience a fair amount of abuse. The lights spend the dark season being squished by milk jugs, bumped by over-stuffed grocery bags and stretched by bulging backpacks that are often crammed in our baskets and bags. Naturally, when Tim dug out last years’ light stash from our bike-decorating supplies and tested them, he realized that ALL of the lights had broken wires and/or bulbs. Normally Tim would spend hours fixing lights; replacing bulbs and soldering broken connections, but he didn’t have time for that light-fixing business this year, he’s been too busy building a deck in our backyard in his spare time. Even though we planned on replacing them, he kept the old stash, and promised to fix them some day in the future. Everyone needs a winter soldering project on occasion, don’t they? Because we can’t haul trees without properly lit and decorated bikes, I started a quest for new (cheap) battery-powered lights. After striking out at Bartell Drugs where they wanted $6.99 per 20 light strand (! ); I headed to Grocery Outlet. We’d had luck with lights there in the past. And since I’d venture to guess that most cheap-Chinese-battery-powered-lights are made in the same factory, why not buy them at 1/2 price? Thank goodness Grocery Outlet came through again, $2.99 per 20 light strand! I bought most of the lights they had on the shelf, because we have four bikes to light. I threw in a few more to use as spares and for Tim’s annual-bike-wheel-wreath making project. Do you have a source for battery-powered-bike-lights? If so please share in the comments! This entry was posted in alternative transportation, Bicycle Christmas, bikes, consumerism, Everyday Biking, shopping and tagged Bicycle Christmas, Bike Lights, christmas lights, decorate, holiday light. Bookmark the permalink. I’m so happy your my sister Anne. Thanks for the post. I bought a live indoor delicate fir tree that can’t take a lot of weight and plan on heading to Grocery Outlet thanks to you. Right back atcha, Mary. Thanks for being my bigsisterfriend (and cheerleader)!